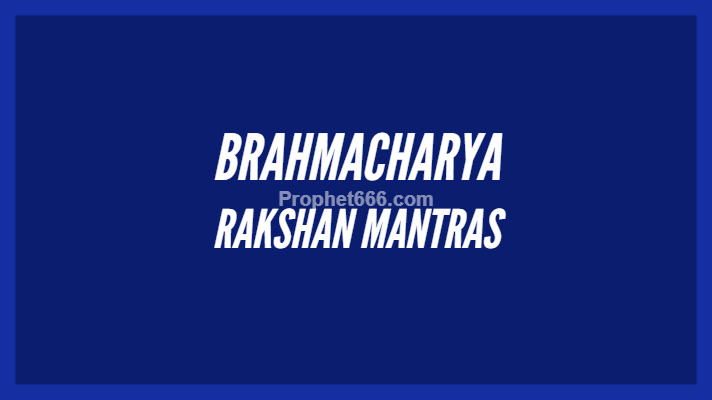 In this post, I have written about 4 different Celibacy Protection or Brahmacharya Rakshan Mantras. These Mantras, which are chanted by many Sadhaks who are striving for all kinds of Siddhi Sadhanas are considered to be most helpful and beneficial in ensuring that celibacy is not lost, while the Sadhak is engaged in the Sadhana. The specific rule of Brahmacharya or Celibacy, which is mandatory for success is some specific Sadhanas is a major stumbling block for many practitioners who unintentionally loose their Celibacy during the Sadhana Days because for some Sadhanas unintentional nocturnal emission is also considered to be loss of Brahmacharya. Hence, most Sadhaks practice some or the other form of Mantra Chanting so that they strictly adhere to this stringent rule that is mandatory for some Sadhanas, especially those related to the Jain Religion. These Mantras, which have been described in this post have also originated from Jainism. The practitioner can select any one or more than one of the Brahmacharya Rakshan Mantras given in this post because all of them are for the same purpose. However, it would be most appropriate to add that Mantra No 1 and 2 are more similar in nature and Mantras No 3 and 4 give the same result. 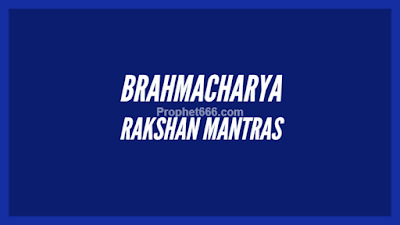 The simple and uncomplicated procedure of practising each of these Brahmacharya Rakshan Mantras has been given below. 1] This Mantra has to be chanted for 1 Mala or 108 Mantra Chants daily in order to protect celibacy. 2] This Mantra has to be chanted for 1 Mala daily for Brahmacharya Rakshan or Celibacy Protection. The practitioner has to use a Blue Colored Counting Rosary while chanting this Mantra. 3] The Celibacy Protection Mantra given below is one of the most popular of the Brahmacharya Rakshan Mantras and it has to be chanted 21 only, sitting on your bed, while going to sleep at night. This is said to ensure that the practitioner does not suffer from unintentional wet dreams or nocturnal emission, while sleeping. 4] The Vidhi for chanting this Mantra and its benefits are the same as those for the Third Mantra. स्वाहा ".यह साढ़े छत्तीस अक्षरों का मन्त्र है . मन्त्र का विनियोग इस प्रकार है --ॐ अस्य श्री हनुमान मंत्रस्य मुनि वशिष्ठ ऋषिः ,अनुष्टुप छन्दः ,श्री हनुमान देवता ,मम कामवासना शमनाय मन्त्र जपे विनियोगः . ह्रदय से लगा है .वे अध्यात्म तत्त्व का चिंतन करते हुए कदलीवन में बैठे हुए हैं . उनकी कांति उदयकाल के कोटि कोटि सूर्यों के समान है .ऐसे ज्ञानदाता श्री हनुमानजी का ध्यान करना चाहिए . मन्त्र का एक लाख जप करना चाहिए .घृत सहित तिल का दशांश आहुति देनी चाहिए .मन्त्र जप किये जाने पर निश्चय ही कामविकार का नाश होता है और साधक हनुमानजी के प्रसाद से तत्त्व ज्ञान प्राप्त करता है .